Based on long-lost recordings, a set of riveting and revealing conversations with America's great cultural provocateurThere have long been rumors of a lost cache of tapes containing private conversations between Orson Welles and his friend the director Henry Jaglom, recorded over regular lunches in the years before Welles died. The tapes, gathering dust in a garage, did indeed exist, and this book reveals for the first time what they contain.Here is Welles as he has never been seen before: talking intimately, disclosing personal secrets, reflecting on the highs and lows of his astonishing Hollywood career, the people he knew FDR, Winston Churchill, Charlie Chaplin, Marlene Dietrich, Laurence Olivier, David Selznick, Rita Hayworth, and more and the many disappointments of his last years. This is the great director unplugged, free to be irreverent and worse sexist, homophobic, racist, or none of the above because he was nothing if not a fabulator and provocateur. Ranging from politics to literature to movies to the shortcomings of his friends and the many films he was still eager to launch, Welles is at once cynical and romantic, sentimental and raunchy, but never boring and always wickedly funny.Edited by Peter Biskind, America's foremost film historian, "My Lunches with Orson" reveals one of the giants of the twentieth century, a man struggling with reversals, bitter and angry, desperate for one last triumph, but crackling with wit and a restless intelligence. This is as close as we will get to the real Welles if such a creature ever existed." "Welles was obviously uninhibited by the invisible tape recorder. The book is a trove of classic-era Hollywood gossip, but if it were only that, it would be, at best, candy. Instead, it's a treasure, both as a portrait of the artist and as a copious record of his ideas--it is, in fact, a key source for understanding Welles, the director and the man." "If you love old movies, My Lunches with Orson is like being handed a big tin of macadamia nuts -- you just keep devouring it." --"NPR""Riveting...This is Welles riffing uninhibitedly on his life and times, lurching from mischief to melancholy...I defy anyone not to feel moved by the narrative arc of greatness laid low by its own luminosity." --"Financial Times""Enthralling...loaded with hilarious digressions and old showbiz tales related by Welles with hugely articulate relish." ""My Lunches with Orson" offers the experience of sitting in on a particular historical-c ultural moment. Read with your Netflix on hand, as Welles's wealth of knowledge inspires re-viewings of both his own films and those of his favorite actors like Buster Keaton and Carole Lombard." ""A wonderfully fluid peek into Welles's mind. Rich with acerbic observations about cinema, theater, filmmakers, actors, politics and the essence of storytelling, "My Lunches With Orson" might be the elephantine storyteller's last great work." 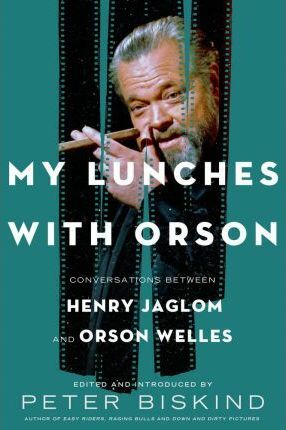 ""What makes "My Lunches With Orson" appealing is the piquancy of the much younger, skinnier [Jaglom] taking on the Sisyphean job of reviving the Falstaffian outcast." ""If it wasn't bad enough that I--and every other director--have to compete historically with Orson as a filmmaker, now we have to compete with him as a pure storyteller and a true raconteur, a man whose breadth of knowledge and experience may never be equaled again in this industry. The good news is that his declamations on every subject are alternatively penetrating, illuminating, shocking, rude, funny, true, or all of the above. I read this in one sitting; I can't imagine anyone doing otherwise." ""It's time to add another line of adjectives to our descriptions of Orson Welles. In this remarkable collection of conversations, we come upon Welles the conversationalist provocateur who can't open his mouth without saying something outrageously funny, fiercely opinionated, and always off-center about the men and women he claims to have known, played with, worked for, slept with, been courted and betrayed by, and admired or detested (often simultaneously) during his half century in show business. I laughed so hard I had an asthma attack." ""We don't often get close to a legend, but here we have lunch with one week by week, in the last years of his life. Welles's conversations with Henry Jaglom glitter with memory, intelligence, and malice, and above all offer a magnificent act of self-impersonation: Orson Welles playing Orson Welles." ""When Henry Jaglom sent me the galleys, I was skeptical about their entertainment value. But as soon as I picked them up, I was hooked. Welles was an ornery, sometimes unpleasant genius, but his opinions on just about everything and everyone were unvarnished. You can almost hear the silverware clinking and the waiters delivering lunch as the likes of Richard Burton drop by to pay their respects... For those not fortunate enough to have Hollywood running through their family tree, this book may be the next best thing." --Ralph Gardner Jr., "The Wall Street Journal"
Peter Biskind is the acclaimed author of "Easy Riders," "Raging Bulls," "Down and Dirty Pictures," and "Star," among other books. His work has appeared in "The New York Times," the "Los Angeles Times," "The Washington Post," "The Nation," and "Rolling Stone." He is the former executive editor of "Premiere" and the former editor in chief of "American Film," and is a contributing editor to "Vanity Fair." He lives in upstate New York.